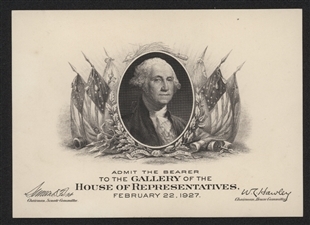 A visitor who came to Congress on February 22, 1927, would have needed a pass like this one to see the Joint Session to commemorate the birthday of George Washington. 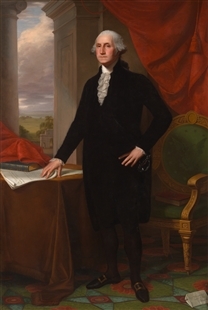 The Army Band played “Hail to the Chief” when President Calvin Coolidge stepped into the House Chamber to address Representatives, Senators, Cabinet members, diplomats, and military officers, as well as a packed audience in the galleries. The event was received with great fanfare in the United States and abroad as audiences tuned in to an extended radio broadcast.